The US Fish and Game Department in Arizona seized Rio, a male serval along with two other servals. An unlicensed individual had several exotic cats confined to crates and was breeding them illegally. When you can google “baby serval” and find so many listings every single day offering them for sale, we wonder how many more are out there in the same situation as Rio was in? 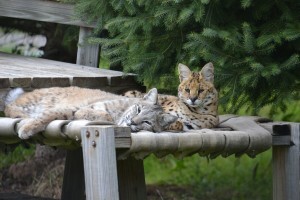 Rio and his sister, Mesa, were just adolescents when they arrived at The Wildcat Sanctuary. But Rio quickly became a very dominant serval and was being aggressive to the other cats he was living with. For their safety, Rio was introduced to a new habitat mate, our bobcat Nikko. Nikko is a very large cat and helps temper Rio’s big ego. Nikko has been able to deal with this very large and lanky serval. By becoming Rio’s sponsor, you can help us provide Rio with all he needs; i.e. a nutritious diet, quality veterinary care, habitat improvements, and the enrichment he needs to make life in captivity challenging for him. Rio, and all of us at the Sanctuary, would truly appreciate your becoming part of our family of sponsors. It means so much for so many!